John Hillcoat’s last four feature films have each been bloodier than the last, manlier than the last, more mainstream than the last, but not quite as good as the last, as he transitions from gritty Australian dramas to violent American action flicks. The Proposition (2005) is a quiet ode to death in the outback, a pseudo-Western that I give an 8/10. The Road (2009) is a Cormac McCarthy novel brought to life, a post-apocalyptic adventure that I give a 7/10. Lawless (2012) is a crowd-pleasing crime story, a rather typical movie that I give 6/10. And now Triple 9, a modern heist/crooked cop/mobster film that Hillcoat pushes to its limits, pumps the blood out of, and hopes audiences will love. I prefer his early, more indie style to this Hollywood action nod, which left me thinking of other, better attempts at the same concept, not congratulating an original job well done. In the city of Atlanta, Georgia, crime reigns supreme. The Russian mafia are the top players, with Irina Vlaslov calling the shots. With her sister Elena & her nephew Felix by her side, she can control the boy’s father and point him in any direction she desires. Michael is former special forces, and along with his partners Russell & Gabe, the trio can carry out any mission. Irina commands them to rob a bank, not for money, but for one item in a safety deposit box. For such a big job, the three men will need two more, Marcus & Franco, cops who don’t mind breaking the law if the price is right. The new crew will attempt to get in, secure the item, get out, disperse, and wait to get paid; sounds easy, right? Meanwhile, two more cops are investigating the bank robbery and attempting to follow a trail of clues to its genesis. Jeffrey Allen is a veteran who may drink too much but who can still solve any case. His nephew, Chris, is new to the precinct, but is just young & idealistic enough to think he can make a difference. With police on both sides of the law, the situation is fairly certain to get hairy, and when Irina demands a second job from a crew that’s already been compromised, the situation will get even worse. Marcus & Chris are forced into a partnership, neither one trusting the other, and neither one guaranteed to live out the week, as friend turns on friend, cop kills cop, and Hotlanta is left bloody once again. 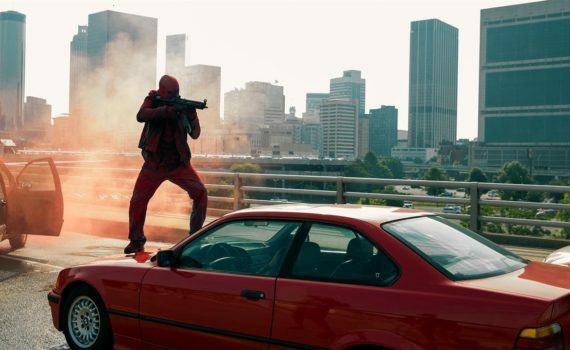 Triple 9 is one part Training Day, one part The Departed, and one part some dumb Vinnie Jones/Michael Madsen/John Travolta gunfight explosion that only my brother-in-law could love. I’ve seen too many of those latter movies, I know what bad acting & bad action looks like, and while Triple 9 is much better than that spoofy genre, it dips its foot into bad water & comes out tainted. The two silent, Jewish bodyguards, the female cop who we have no idea where she came from or who she is, the constant drinking of booze & splattering of brain mater; going over-the-top is easy with this style, and John Hillcoat seems to be getting closer & closer with every film he makes. And the parts that seem like better movies also seem copied from better movies, so even that isn’t much of a leg to stand on. 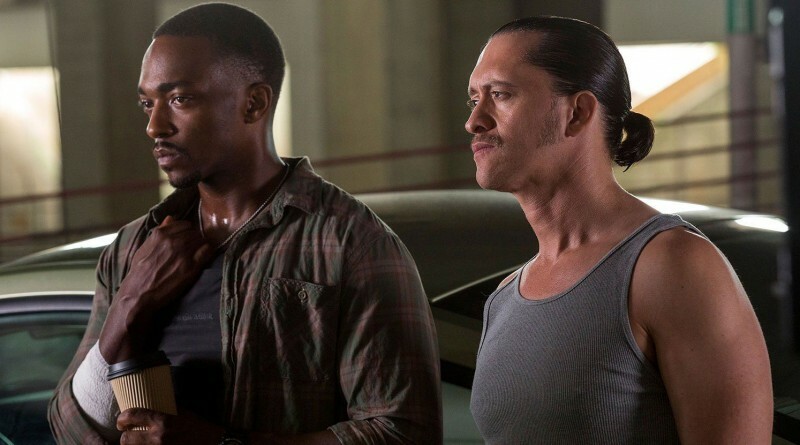 Triple 9 often tips toward the silly, only just managing to find some balance. The saving grace? The actors. First take the starring trio: Ejiofor, Affleck, & Mackie. Ejiofor plays a rare bad guy, but even manages to make that character likeable & heroic, showing off an amazing talent that’s here to stay. Affleck has always been in his big brother’s shadow, but steps our here as a young idealist with chops. And Mackie is no Falcon in this one, more like a street-wise Atlanta kid grown up & holding his gun to the head of anyone who crosses him. And the cast is full of stars far past that: Woody Harrelson, Aaron Paul, Kate Winslet, Gal Gadot, Norman Reedus, Teresa Palmer, Michael Kenneth Williams, Clifton Collins Jr. This is a solid cast, a well-acted movie, and a heist film that you can actually invest yourself in. But it does also always seem about to jump the shark, and never quite lives up to its attractive image; the red paint, the guys in ski masks, the blazing rifles. Much like Godzilla, which incidentally used the same color to grab our attention, the film as a whole isn’t as good as a few great moments of cinematography or as strong as we had hoped. Video – With an aspect ratio of 2.40:1 (1080p High Definition Widescreen) and filmed using Arri Alexa XT M, Plus, & Studio cameras with Panavision Primo & G-Series lenses, Triple 9 is a home run as far as the video quality of the Blu-ray disc is concerned. The picture is of the highest caliber clarity, with a smart use of color against a dark background and each scene carefully crafted. The use of the color red is very intentional in this film, as are most of the shots throughout the film, making this a movie that is visually pleasing with a crispness that impresses. Audio – The Blu-ray disc was done in English DTS-HD Master Audio, with subtitle choices in English, Spanish, & French. Button sounds can be turned on or off in the audio menu. The sound quality is top-notch, with a good balance (for a Blu-ray) between action, dialogue, music, and background sound. Many times Blu-rays overdo the sound effects, blowing out any spoken lines, but this film held itself back nicely. Extras – There are a few special features on the Blu-ray disc. Deleted Scenes can be played individually or all in a row: Michael’s First Kill, Jeffrey Quits, Jeffrey Finds Out About Leah, Michael’s Death. Under the Gun is a 3-minute extended look with short cast interviews. An Authentic World is a 3-minute behind-the-scenes featurette. And there are eight trailers: Spotlight, Rosewater, Nightcrawler, The Loft, Dope, End of Watch, The Gunman, Rock the Kasbah. Recommended. 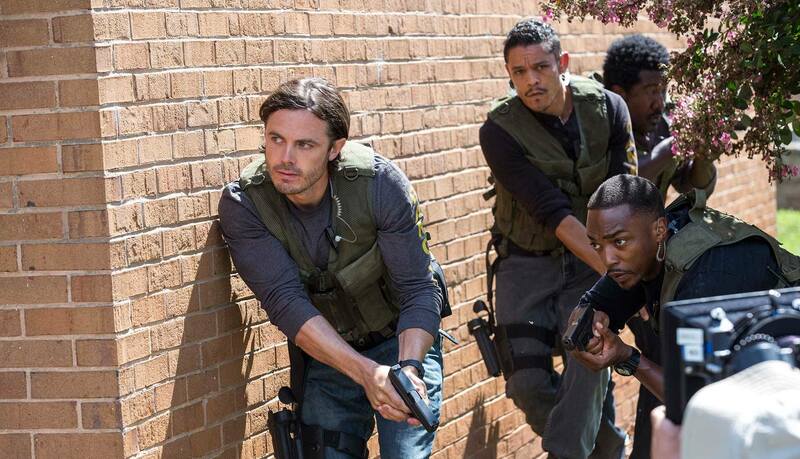 Triple 9 is a good action movie with a great cast, but lacks the finesse to make it one to remember. It keeps itself from becoming extreme by a hairsbreadth, holding back just enough to let its solid actors take care of the plot. They do, the film works, but it won’t go down as a modern Departed or even a bloody Italian Job. I did really enjoy seeing Ejiofor & Mackie is dangerous roles, that was refreshing, but the film as a whole just wasn’t. The video is very strong, the audio is as well, and there are some extras to enjoy on the Blu-ray disc. So I can recommend this film, but perhaps only to a select few, those who find themselves smack dab in the middle of two genres: the dark character drama crime film & the lighter action-packed shoot-em-up movie. Triple 9 is a bit of both, and so straddles the fence, attempting to please all while not exactly letting anyone fall in love.